When I booked my trip to China I was completely torn between visiting Shanghai and Beijing because there was so much that I wanted to experience in both destinations. After much deliberation I booked my trip to Beijing, but within days of booking I had already booked some internal flights to Shanghai so I could enjoy, not only a trip to Beijing, but also a Shanghai city break. Airline & Airport of Operation: I flew from Beijing Nanyuan Airport which was located south of Beijing city centre, around a thirty minute taxi ride from our hotel. The return flights from Beijing Nanyuan Airport to Shanghai Pudong Airport cost around £180pp and is operated by China United Airlines. It was around 45 minutes in a taxi from Shanghai Pudong Airport to our hotel in central Shanghai. If you are flying from the UK to Shanghai you can choose from British Airways, Virgin Atlantic as well as a range of Chinese airlines, who all fly from London daily. Transfer Time to City: Shanghai Pudong Airport is located 20 miles from central Shanghai, and takes around 45 minutes to an hour in a taxi and costs around £20. For my Shanghai city break I booked a room for the night at the 5* Guxiang Hotel Shanghai. The Guxiang Hotel Shanghai is located right in the city centre just off Nanjing Road, and just a ten minute walk from Shanghai’s famous Bund waterfront. I booked a standard double room for my Shanghai city break on hotels.com at a cost of £99 for the night, but at check-in I was given a complimentary upgrade to a Junior suite. When you step foot in the hotel you can immediately sense the grandeur of this hotel with its two storey height atrium in reception, shiny marble floors and beautiful furniture and plants. There was a bar and cafe within the lobby area, and a restaurant on the first floor where some of the tables are located on balconies overlooking the lobby below. Guxiang Hotel Shanghai offers a range of facilities, including restaurants, bars, meeting and conference rooms, pool, spa and gym. Unfortunately during my stay I didn’t get the chance to use any of the hotel’s facilities because we arrived quite late in the evening and left mid-morning the following day, I did however order room service after arriving at the hotel. Due to the late hour there was a more limited selection of food available, so I didn’t get my first choice of Singapore rice noodles, but they did offer me a vegetarian alternative which I accepted and it was a very delicious alternative. My suite at the Guxiang hotel was extremely spacious and very classically decorated. The suite comprised of three main rooms, a large bedroom and separate lounge with an equally large bathroom. The bedroom and the lounge had large windows spanning much of the width of the rooms giving stunning panoramic views across central Shanghai. My stay at the Guxiang Hotel Shanghai was far too short, I wish I had stayed there for a couple of nights. When you visit the Bund waterfront and look out across the Huangpu River you can’t help but notice the busy skyline dominated by what looks like hundreds of skyscrapers. There is one building that is sure to catch your eye, it’s not the tallest, but it is the most unique. This building is called the Oriental Pearl Tower. The official name of the Oriental Pearl Tower is the Oriental Pearl Radio & Television Tower. The tower is located in the Pudong new area of Shanghai, just across the Huangpu River from the Bund waterfront. The tower, designed by Jiang Huan Chen, Lin Benlin and Zhang Xiulin, started construction in 1991 and was completed in 1994, reaching 368 meters in height. You can visit the various lookout points in the tower and you could easily spend an entire day there. There are observation decks at 90, 263 and 351 meters, as well as a glass walkway, bar and restaurant at the 263 meter observation deck. There is also a space-themed floor on the uppermost lookout (351 meters). There are also shops and a museum in the building. There are various levels of entry that you can purchase for your visit, but to make the most of your visit I’d suggest the complete package which gives you access to all floors and the museum. The cost per person is around £24. Expect to queue for around half an hour at most times of the day for the initial lift to the observation decks. Shanghai’s old market area, or Yuyuan Old Street as it’s known, is definitely worth a visit while in Shanghai. I visited only briefly at the end of my second day, and wish I had visited sooner and spent a bit longer there as it was a really interesting and beautiful location. All the buildings in the area are traditional Chinese style buildings, with parks and waterways beautifully integrated into the layout of the area. This area of Shanghai dates back over one thousand years when it was a walled city. Most of the wall has long been demolished, however a small part of the wall as well as two of the gates still exist. As well as the Yuyuan Old Street, this area is also home to the beautiful Yuyuan Garden as well as the City God Temple. The Yuyuan Old Street area of Shanghai is very popular with the locals and tourists alike. You will find a plethora of shops here as well as restaurants and local fast food. There are also a few traditional Chinese tea rooms which you can visit. 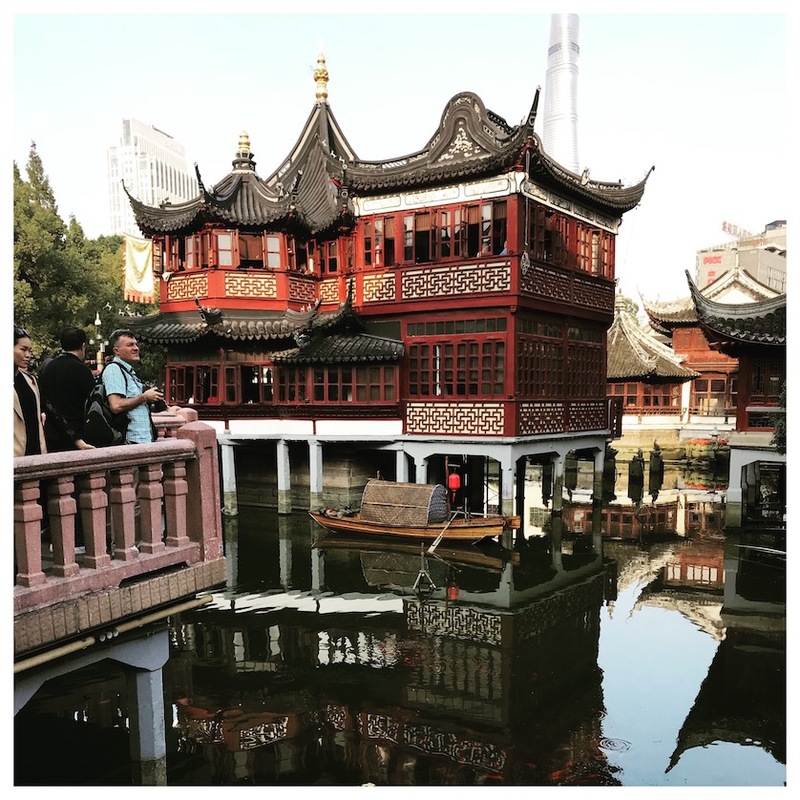 This area of the city is easily accessible on the Shanghai metro, just take line 10 to Yuyuan Garden station and you will find yourself close to the centre. Shanghai Disney is located quite close to Pudong Airport We took a taxi directly from the airport and it took just 15 minutes and cosy just under £10. You can reach Disney easily from Shanghai city by either bus, taxi or train. Shanghai Disney currently only has the one park which costs around £50 per person entry for the day. The park is located in the centre of the Disney resort and in this area you will also find shops, restaurants and the many Disney hotels. The Disney park is quite large but you could easily get around it in one day as the park is open from 8am until 10pm for the majority of the year. There are a large number of rides at the park with options for all ages. During our visit the park was being extended to accommodate even more fantastic rides. There are numerous restaurants, canteens and kiosks located all around the park and the food is very good value compared to the Disney parks in America and Paris. Top Tip: I actually have two tips for Shanghai, the first for Disney, and the second for Shanghai in general. Firstly, while at Disney be sure to experience the Pirates of the Caribbean and the Tron rides, and be sure not to miss the illumination show at 8:30 every evening as this is truly spectacular. And secondly, if you need a great way of getting across the Huangpu River then take the Bund Sightseeing Tunnel which will cost around £6pp return and take around 4-5 minutes. Currency: China’s currency is the Yuan Renminbi, and at my time of visiting the exchange rate was around 9 RMB to 1 GBP. For simplicity we just worked on the ratio of 10 to 1 during our trip. Weather: I visited Shanghai in late October and the weather was in the early 20s and sunny, but quite hazy on most days which was due to the high level of pollution. Best Time To Go: The best time to visit Shanghai is October and November because at this time of the year you will experience the most comfortable temperatures. The summer months tend to be the wet season and winter can be quite cold. You should watch out for Chinese holidays as during these times you will not find many shops, restaurants or attractions open. Recommended Duration: During my 5 night stay in China, I spent just two days in Shanghai and I felt this was no where near long enough. I would recommend a minimum stay of 4 days in Shanghai as there is so much to see and do in the city and nearby area. Conclusion: I thoroughly enjoyed my time in Beijing but as I’ve now seen the main sights I don’t currently have any urge to return any time soon. However, I would certainly visit Shanghai again in a heartbeat. The best way for me to sum up Shanghai is that it is the New York of Asia! It’s a cosmopolitan, vibrant city with so much going on at all times and infinite amounts of things to see and do. I would love to return to Shanghai, but definitely for longer than two days next time.